Not too long ago I asked Herbies on the HH Facebook page what topics they'd like to see covered for Teaching Tuesday. 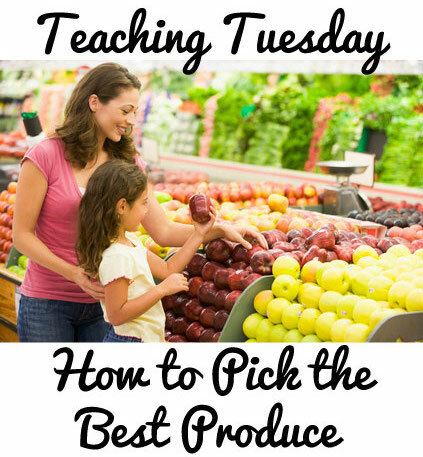 Someone suggested how to pick the best produce, and I thought it was a brilliant idea! I've put together a cheat sheet of the most common fruits and veggies featured in HH recipes (and the 7-Day meal plans), and what you should look for when browsing the produce section or farmer's market. Apples:Pick apples that are heavy for their size, firm, naturally shiny and deep in color. Avocados: A ripe avocado should be slightly soft with a dark green skin. If it's bright green and hard, it won't be ready for a couple of days (you can always speed up the process by putting it in a brown paper bag). Bananas:Look for ones with a couple brown spots; that means they're at their best. Like an avocado, if their skin is green, it will be a couple days until they're ready to eat. Broccoli: The crowns should be dark green and firm to the touch. Carrots: Pick carrots that are firm and smooth without little rootlets. Citrus: Look for a fruit that's firm and bright in color. Corn: Look for corn with a thick, bright green husk. Don't buy ones that have dry ends. Another good tip: the heavier the ear, the more moisture it's retained, which means it's healthy. Cucumbers:They should be dark green and firm. Eggplant: Eggplants should be dark purple in color. If you gently press on the skin, it should give slightly and bounce back. Avoid eggplants with soft spots and/or wrinkled skin. Kale: If you gently squeeze the leaves, healthy kale will make a squeaky sound and bounce back immediately. It will also be rich in color. Lettuce/Greens: Look for lettuce or greens that are crisp and healthy. Mangos: Choose mangos that are slightly soft to the touch and fragrant. Melons: If you can close your eyes and identify the melon by its smell, you have a winner. Onions: Avoid onions with sprouts or soft spots. Pears: Select pears that are starting to get soft below the stem. They should also be free of bruises. Peppers: They should be firm, naturally shiny and heavy. Potatoes: Spuds should be smooth, oval in shape and firm. They shouldn't have wrinkled skin or spots. Strawberries: Look for strawberries that are fragrant, red (not yellow or green), and shiny. Don't forget to check the bottom of the basket/container for bad or moldy strawberries. Mold spreads fast! Summer Squash/Zucchini: The skin should be bright and consistent, rubbery and have a nice sheen. Tomatoes: Find a tomato that has a nice red color and is soft enough to squeeze, but doesn't break the skin. Watermelon: Avoid watermelons that have a strange shape (i.e. asymmetrical). The heavier ones have more water and will be juicier. Winter Squash: Choose a squash that's heavy. Avoid ones that are soft and have dark spots. One final note... When in doubt, you can always ask an employee or just go with your instinct. Chances are if the produce doesn't look good, you probably won't want to eat it.